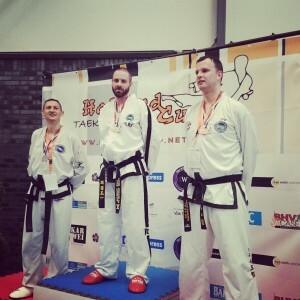 Over the weekend Tunbridge Wells instructor Mr Luke Thompson competed in the Holland Cup. It was a great weekend celebrating the 60th Anniversary of Taekwon-Do representing England and Vision. Mr Thompson returned with 3 medals: Gold in sparring, silver in team patterns and bronze in individual patterns. Next up it’s the Tunbridge Wells students turn at the Vision Championships on the 9th May! This entry was posted in TKD, Uncategorized and tagged competition, ITF, taekwondo, tkd, vision on 14/04/2015 by Mr T.